BODY BUTTER is an all-natural product that is effective for dry skin and is long lasting. It comes in 2 convenient sizes. SOAP SURPRISE is a Sampler that features trial size soaps and includes a trial size of one of our other popular products. Body Butter is all natural and is made with Sweet Almond Oil, Cocoa Butter, Bees Wax, Jojoba Oil, and Shea Butter. It is long lasting and has the enjoyable scent of Vanilla. Body Butter is an exceptional solution for dry elbows and knees and makes a great Lip Balm. 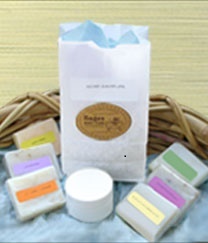 Sage's Soap Surprise comes with six individually wrapped soap varieties and a sample jar of Body Lotion, Sugar Scrub or other sample product. We will surprise you with the varieties so you can experience new aromatic treats. 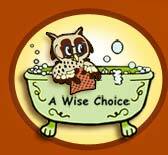 Larger than typical trial size, the samples will give you a fair chance to try out the soap. They work perfectly as guest soaps, and you might want to have some on hand to give as gifts.